In December, Leonardo Helicopters at 3050 Red Lion Road successfully completed the first flight test of the new TH-119 helicopter model. Now, the company is bidding for the model to be the official undergraduate training model used by the U.S. Navy. If selected, Leonardo would manufacture a fleet of more than 125 helicopters. It would be the first single-engine IFR (instrument flight rules) certified helicopter in production in decades. To put it in simpler terms, the helicopter is a “one stop shop,” said Andrew Gappy, director of Navy, Marine and Federal Department and Agency Programs at Leonardo. “It’s a full spectrum trainer – equally as good as taking someone out for their first helicopter ride as it is doing more advanced flying,” Gappy said. Single-engine helicopters have greater movement than aircrafts with multiple engines, and can accomplish fundamental training flights like sliding landings, hovering and full autorotations. They can also accomplish more advanced training flights like NVG (night vision goggles), instruments, navigation, tactics, hoist, external cargo and search and rescue. Being IFR-certified means the aircraft can competently fly in clouds and weather conditions. 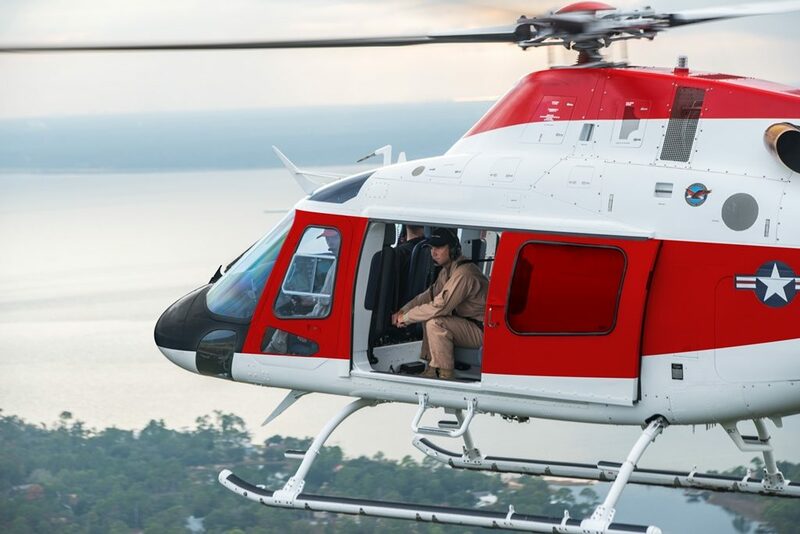 Most single-engine helicopters aren’t IFR certified, which requires having system redundancies such as hydraulic systems and weather protection. Bill Hunt, CEO of Leonardo, compared operating the aircraft to taking a driving test. The helicopter also features a dual-display Genesys Aerosystems-advanced glass cockpit, which allows the student and instructor to sit in either set interchangeably. The 180-degree adjustable observer seat offers pilots full view of the cockpit. The helicopter is being bid to replace the aging TH-57, which has been used for training since the 1980s. The Navy is doing an acquisition of competitive commercial projects, which means helicopters without weapons systems. Once they select the new model, they will start buying it by fiscal year 2020 and entirely replace the TH-57 by 2023. If the helicopter were selected, it would be the first time individuals training in the Navy would operate a helicopter. Individuals are required to receive 130 hours of flight training on the undergraduate level to “earn their wings” and can move on to other areas such as combat flight. “It’s the best flight training on the planet, taking someone who’s never flown before and making them very capable,” Gappy said. It producers between 550 and 650 pilots per year. 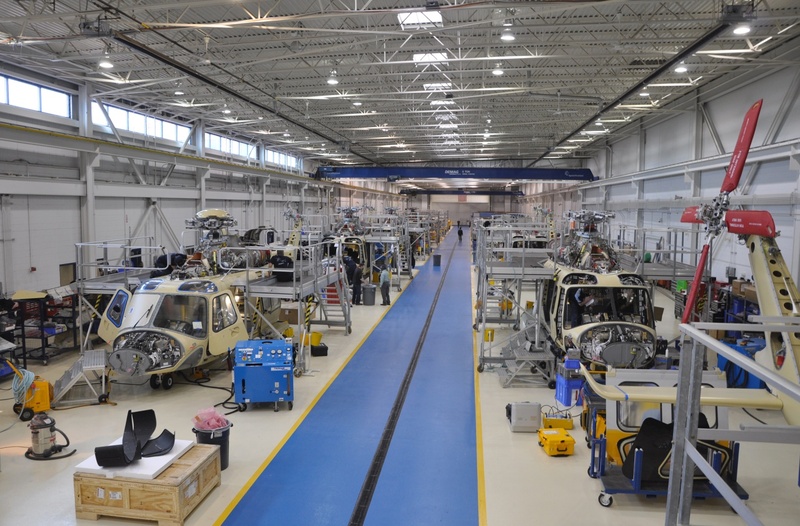 Leonardo provides true final assembly for the helicopters, which means parts from all over the world are sent to Northeast Philadelphia to be assembled. It’s the only location worldwide where TH-119 final assembly takes place. As of the end of 2017, there were approximately 517 helicopters produced by Leonardo in operation throughout the world. Once the aircraft is assembled, it moves to the flight line, where activities like radio installation and fueling the aircraft occur. Once it’s complete, the aircraft will go through a series of test flights to ensure it is ready to be presented and certified. A TH-119 model typically takes 70 days to fully manufacture, Hunt said. If the Navy were to select the TH-119, he estimated Leonardo would manufacture three TH-119 models a month, as well as other helicopter models they manufacture. “We want to ensure we’re not just delivering a product, but delivering a product we stand behind,” Hunt said. Gappy put emphasis on Leonardo’s and Philadelphia’s capabilities to contribute to Navy training.